Associate Professor Beverly Saylor has been a faculty member in the Department of Earth, Environmental and Planetary Sciences since 1998. Photo by Mike Sands. Saylor had traveled to this stark region to do something she had never done before: participate in a fossil dig. She had joined a roughly 20-person team led by Yohannes Haile-Selassie, curator and head of physical anthropology at the Cleveland Museum of Natural History (CMNH) and adjunct professor in the anthropology, biology and anatomy departments at Case Western Reserve. This was the team’s first season of fieldwork in Woranso-Mille. The site is located in a river valley known for large animal fossils, not far from where the famous Lucy skeleton was discovered in the early 1970s. But what secrets it might hold about human evolution were unstudied and unknown. Saylor has returned to Woranso-Mille almost every year since that initial visit. She spends up to two weeks at a time on site, often working from early morning to late afternoon without a break. The extraordinary effort has paid off. 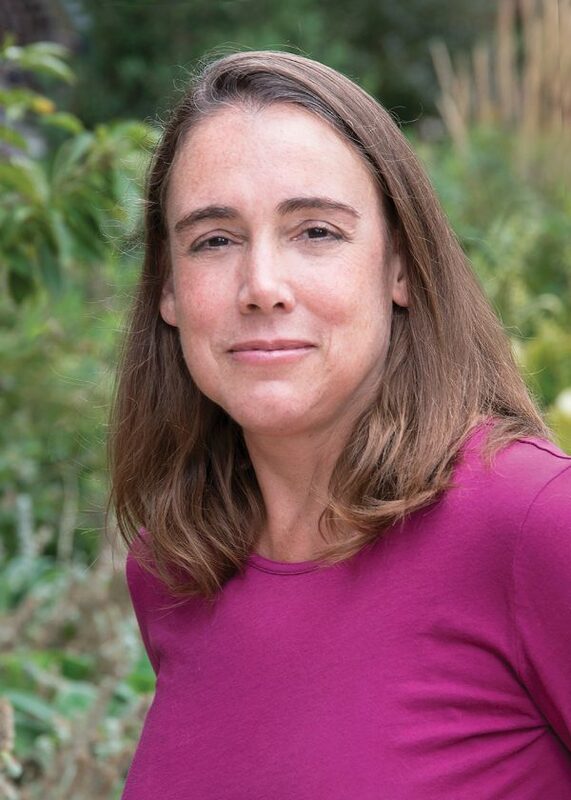 Saylor has provided key geological insights that have helped rewrite our understanding of humans’ ancestors, and her collaboration with Haile-Selassie has taken her career in directions she never anticipated—leading her, for example, to take part in a separate project that could transform scientists’ view of the prehistoric Amazon basin. She stayed at MIT to complete her master’s and doctoral degrees. After a two-year stint as a postdoctoral fellow at the University of Wisconsin–Madison, she joined Case Western Reserve’s Department of Earth, Environmental and Planetary Sciences in 1998. At the time, she focused on teasing out clues to the Earth’s past from ancient rock layers. In Namibia, for example, she used marine rocks dating back 540 million years to help nail down the date when the planet flipped from an ice-encased, biologically depleted “Snowball Earth” to one warm enough to produce an explosion of biodiversity. Beverly Saylor (left) takes notes about younger conglomerate (gravelly sedimentary rock) that lies on top of fossil-rich exposed rock. She is accompanied by Joshua Angelini (CWR ’07, GRS ’09), who did fieldwork in Ethiopia while pursuing his master’s degree. Photo by Elizabeth Russell/Cleveland Museum of Natural History. The Ethiopian-born Haile-Selassie had already established himself as one of the world’s top paleoanthropologists. At CMNH, he occupies the post previously held by Donald Johanson, who in 1974 unearthed the 3.2-million-year-old Lucy and showed that bipedal human ancestors had lived far longer ago than anyone had thought. But before coming to CMNH, Haile-Selassie had worked only on other people’s teams. “I’d always wanted my own study area,” he says. 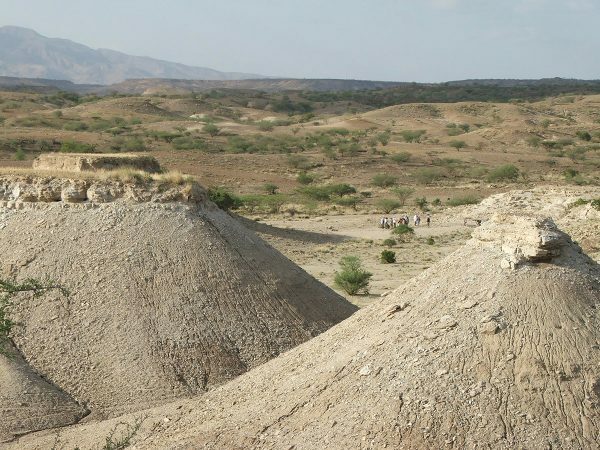 The Afar region of Ethiopia, which includes Woranso-Mille, had already yielded abundant fossils of early human ancestors. A brief scouting trip in 2002 convinced Haile-Selassie that Woranso-Mille itself might hold a trove of such fossils. In 2004, he secured the Ethiopian government’s permission to explore the site. Bringing different forms of expertise to the project was essential. It is not enough for paleoanthropologists to dig up and study bones and teeth. They need ecologists to reconstruct the ancient ecosystems, and geologists to tell them what the physical environment was like—and, crucially, when and where the fossils were buried. Sedimentologists and stratigraphers such as Saylor puzzle out the processes that deposited ancient rock layers. It’s a tall order; the Earth’s surface heaves and sinks over time, crumpling the layers and making them difficult to read. But various other geological specialists step in to help make sense of it all. For example, paleomagnetism experts determine the age of rocks by examining the orientation of minerals containing magnetic elements such as iron (the Earth’s magnetic field has flipped back and forth many times over the eons). Geochronologists gather clues from atoms that decay radioactively at a fixed rate. 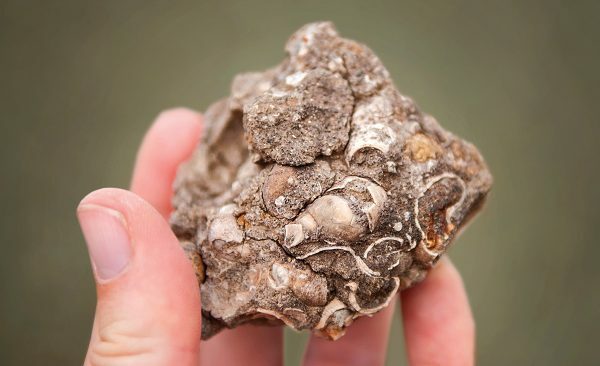 This rock from the Woranso-Mille site in Ethiopia contains gastropods, or snail fossils. Such specimens are of interest to scientists because they may indicate the presence of freshwater ecosystems. Photo by Elizabeth Russell/Cleveland Museum of Natural History. While the paleontologists were scouring small areas of soil for bones and teeth, Saylor and the other geologists on the team fanned out over the site, looking for rocks they could use to reveal the past. “Paleontologists walk around in small circles; geologists walk around in big circles,” Saylor jokes. “The assistant who has to go with the geologists is the most unhappy because we walk further.” And because the geologists are typically on site for only a fraction of the study period—perhaps two weeks out of two months—they put in long hours, often skipping lunch. The hills of ash and pumice in the foreground are tuffs, some of which erupted from a volcano visible in the distance, and others from volcanoes 1,000 kilometers away. These tuffs help researchers determine the age of fossils, both in absolute time and relative to specimens from anthropological field areas. Photo by Elizabeth Russell/Cleveland Museum of Natural History. Among the rock layers, Saylor identified many volcanic “tuffs,” composed of consolidated ash and a lightweight rock called pumice. These formations contain their own internal clock: potassium-40, a radioactive isotope that converts to argon at a steady rate. 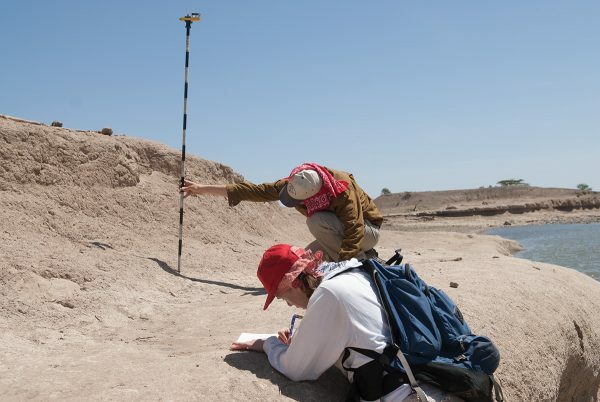 Once the geochronologists on the team measured the ratio of argon to potassium-40 in the tuffs, it was possible to determine a minimum age for the fossils buried beneath them. As with most new excavations, the first year of the Woranso-Mille project didn’t immediately yield big revelations. But things picked up in 2005, when the researchers recovered a partial skeleton of an early human ancestor. In 2010, they reported the find in The Proceedings of the National Academy of Sciences and assigned it to Australopithecus afarensis, the same species as Lucy. The partial skeleton was preserved in rock layers that are around 3.58 million years old. A second major find, in 2009, consisted of several 3.4-million-year-old partial foot fossils. They came from the same area and time period as those of A. afarensis. But when Haile-Selassie and his colleagues reported what they called the “Bertele foot” in Nature in 2012, they argued that it belonged to a different species. Unlike those of Lucy and her relatives, this foot had an opposable toe more suited for tree climbing than for walking and running. The conventional wisdom had been that only one hominin, or human ancestor, inhabited a given place at a given time, and that the various species appeared in succession, as in the common but misleading parade of walking primates showing the supposedly linear and inevitable progress of evolution from monkey to man. Now paleoanthropologists and paleoecologists had to explain how at least two pre-human species might have shared resources and gotten along in one place at one time. The geologists had to figure out why such a find had occurred in Woranso-Mille and not elsewhere. 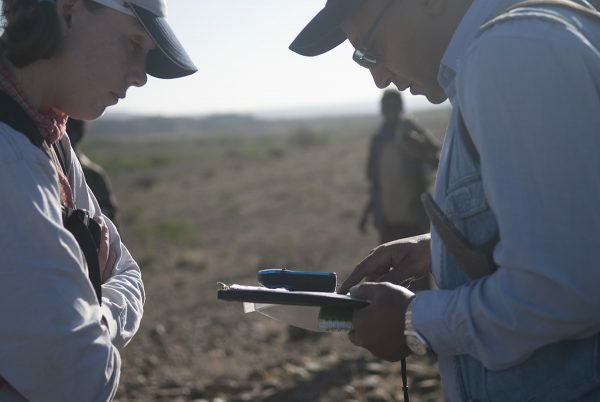 From left: Saylor reviews field notes with fellow geologist Mulugeta Alene Araya, an associate professor at Addis Ababa University’s College of Natural Sciences. Photo by Elizabeth Russell/Cleveland Museum of Natural History. In 2015, the team dropped another bombshell. They reported that 3.3-to-3.5-million-year-old jawbones, found near the Bertele foot but in different rock layers, belonged to a previously unknown species. They named the species Australopithecus deyiremeda (deyiremeda means “close relative” in the Afar language). The New York Times hailed the discovery: “The Human Family Tree Bristles With New Branches.” But not everyone agreed. Some believed the jaws could be from A. afarensis individuals with features slightly different from those of previously identified skeletons. Haile-Selassie and his colleagues, however, remain convinced that A. deyiremeda is a distinct species; they are now analyzing more recent finds that they think will bolster their case. Buoyed by their success thus far, members of the research team plan to continue working at Woranso-Mille for the foreseeable future. Meanwhile, Saylor’s fossil research has also led to other opportunities, one of which has made her one of the few people who have gotten to Bolivia by way of Ethiopia. In 2012, Case Western Reserve paleontologist Darin Croft, a professor in the School of Medicine’s Department of Anatomy with a secondary appointment in the Department of Biology, asked her to join a team he was putting together to study Quebrada Honda, a site in the southern Bolivian highlands. It was a fortuitous request, because Saylor soon roped in two other specialists from the Woranso-Mille project. Although it is a fossil site, Quebrada Honda differs from Woranso-Mille in just about every other way. Neither flat nor relatively low-lying, it’s nestled among steep slopes around 11,500 feet above sea level. Intense seasonal rains make it unreachable for part of the year, and during the dry season, when Croft’s team works, nighttime temperatures can dip below freezing. The fossils are much older—between 12 and 13 million years old, long before humanlike forms appeared in Africa, much less reached the Americas. The researchers’ goal is to understand why the fossilized mammals found at Quebrada Honda are so different from those discovered at other, equally old South American sites. Quebrada Honda’s high elevation does not explain the differences, Croft says. The researchers have unearthed the bones of tortoises that could not have survived more than a few thousand feet above sea level; thus, the region must have been much lower in the past. Such discoveries also play into a larger conversation about how the modern-day Andes Mountains and Amazon basin formed. Saylor’s job is to place the researchers’ fossil finds and analyses in a consistent context. “Beverly is really the glue that holds a lot of these studies together,” Croft says. 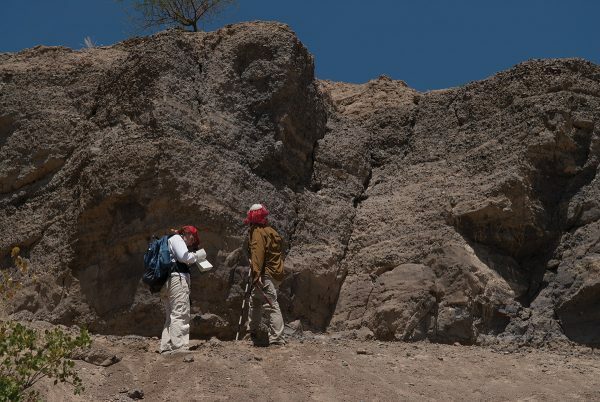 Saylor (taking notes) and Angelini measure ancient buried soil above a volcanic tuff. Photo by Elizabeth Russell/Cleveland Museum of Natural History. Saylor admits that her geological research will never inspire the kinds of headlines that fossil finds do. But that doesn’t make her any less excited about the insights she’s generating. She has developed a detailed understanding of how Woranso-Mille’s mishmash of volcanic tuffs and basalts came into being. In Bolivia, she’s excited about new techniques to determine the past elevations of rocks based on the isotopes they contain. Gabriel Popkin is a freelance writer in Mount Rainier, Md.